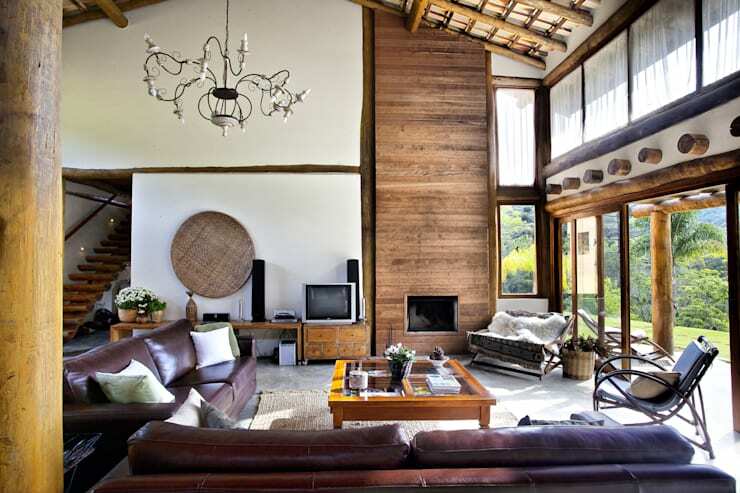 The interior designers and decorators at Bianka Mugnatto Design de Interiores bring you a very rustic house that integrates beautifully with its natural surroundings. 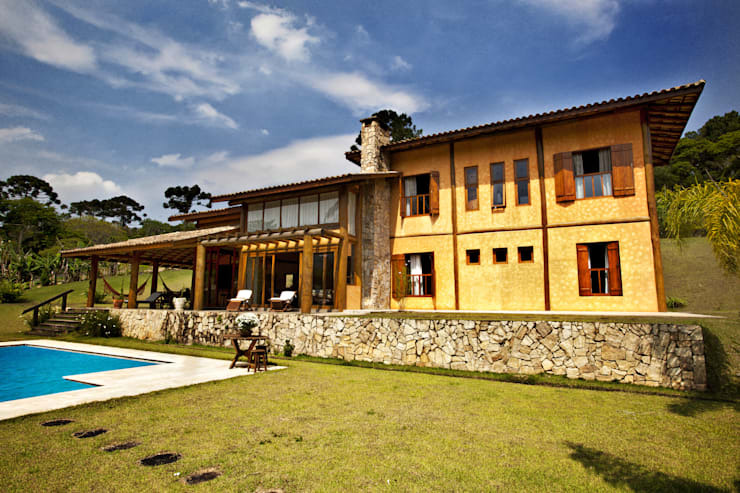 The use of wood, concrete, stone and earthy colours makes this residence a charming affair. 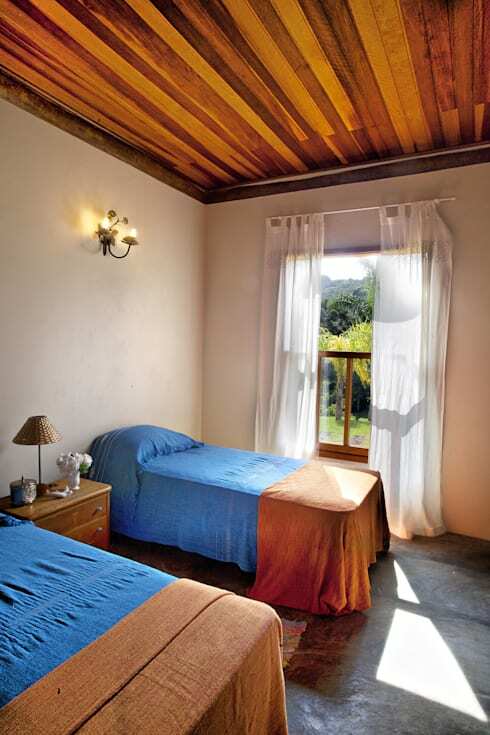 Its interiors are rustic too, yet very practical and cosy. Modern ideas and convenient layouts ensure that living here is a dream-come-true. The colours used inside are mostly white and different shades of brown and grey. This creates a classic and elegant vibe. 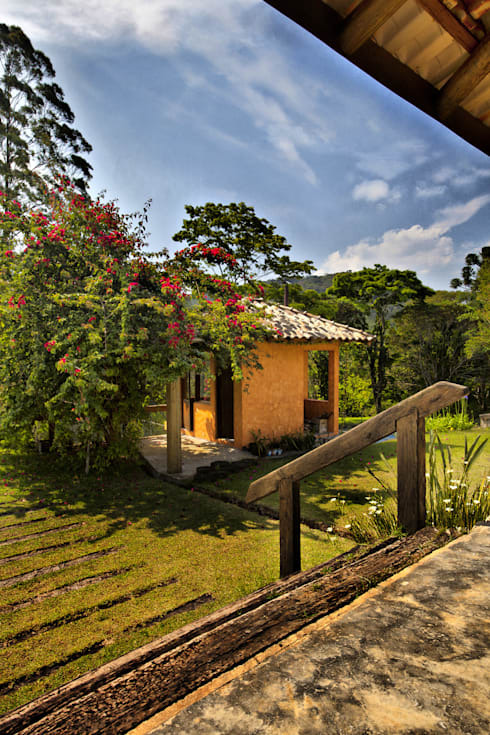 Gently sloping shingled roofs and warm yellow walls make this house truly picturesque. 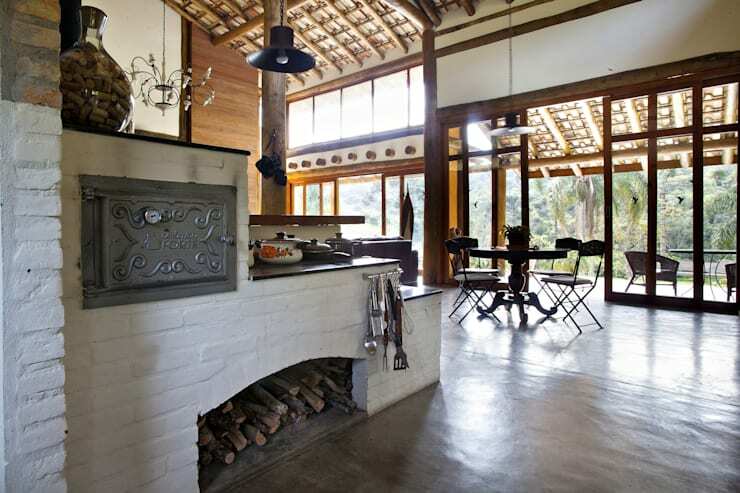 Stone, concrete, slate and wood join hands for an earthy and inviting look. The surrounding landscape is green and lively. The living, dining and kitchen are well merged on the ground floor for an open and airy look. 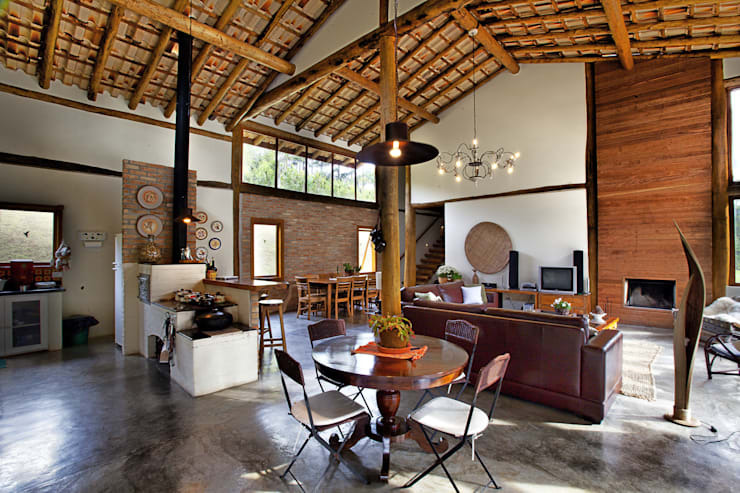 Lavish use of wooden beams, stone wall panels and burnt concrete floor enhance the rustic feel here. 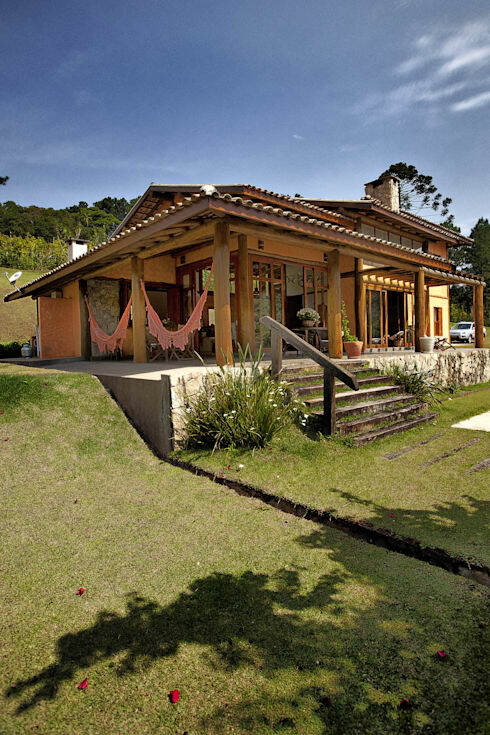 Manicured green grass and lush plants surround the house for a very lively and refreshing atmosphere. The drainage system is open and by using recycled wood for the handrails, the house has celebrated sustainability in style. 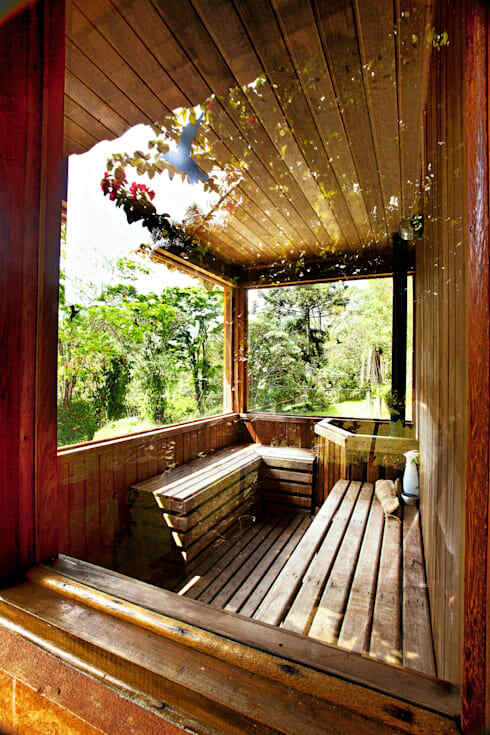 Rendered elegantly in wood, this spacious and warm sauna features large glass windows that connect you with verdant nature. Terracotta tiles, natural stones, a burnt concrete floor and wooden elements come together to make this terrace a cosy place to relax and enjoy outdoor meals. 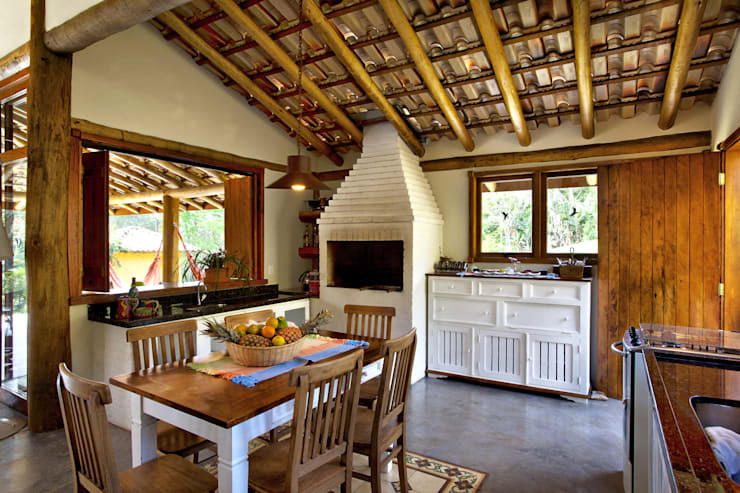 This extremely rustic kitchen is a beautiful blend of dark natural wood and touches of white. The effect is very warm, cordial, and classic. Bricks, neat black countertops, a traditional fireplace and a bold black chimney make this gourmet kitchen both rustic and colonial. 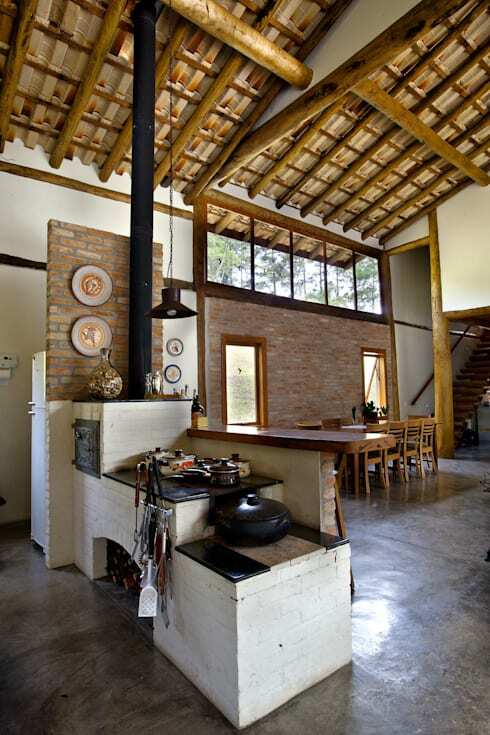 This brick and clay stove is reminiscent of colonial kitchens and looks very rustic too. 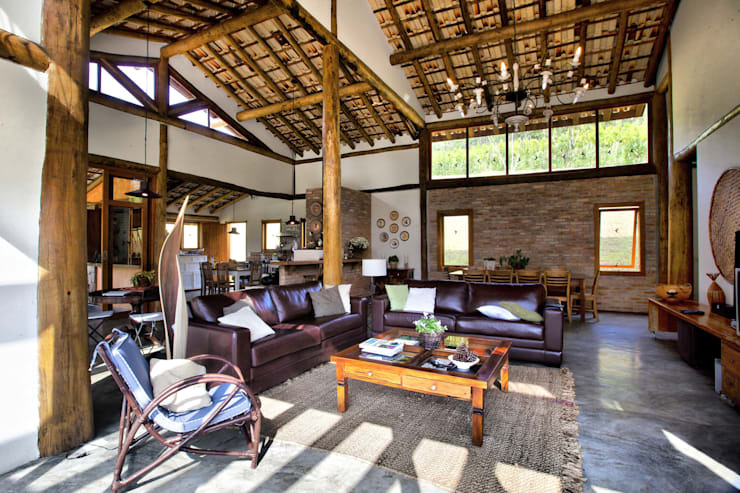 The rustic living area features modern black sofas and a vintage armchair for an eclectic look. It is spacious, simple yet very luxurious. From this angle, you can see how a cedar wood panel enhances the beauty of the inbuilt fireplace, while glass doors bring in ample sunlight for a bright look. 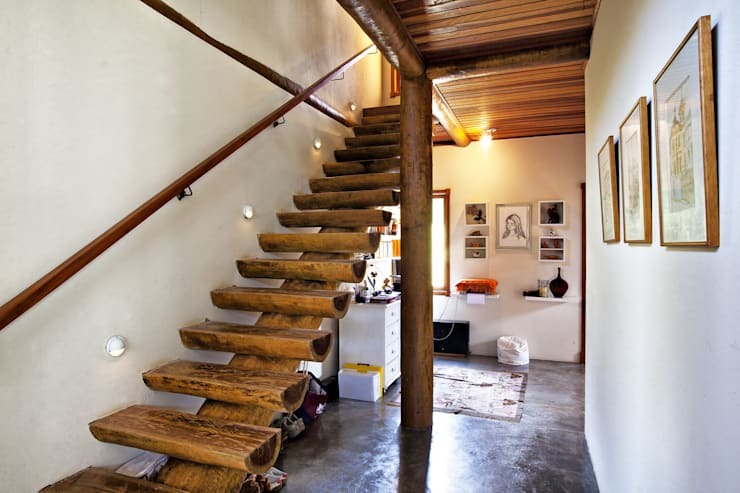 Crafted with eucalyptus wood, this rustic wooden staircase is very elegant and unique. Wood and white make for a very classy and peaceful look in this charming bedroom. 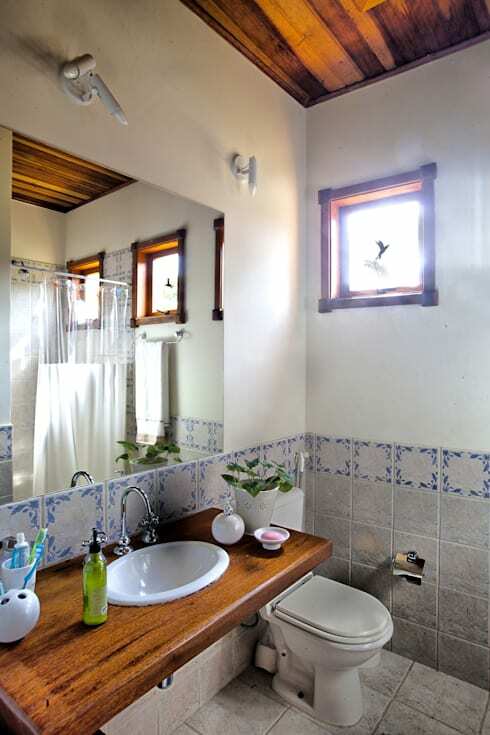 Wood and white once again make this bathroom vintage and charming, while the large mirror is a bright touch. 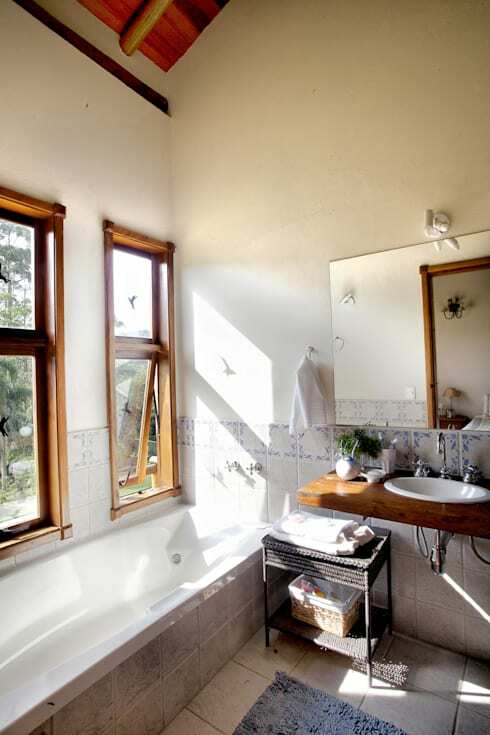 Stylish tall windows flood this bathroom with tons of sunlight. 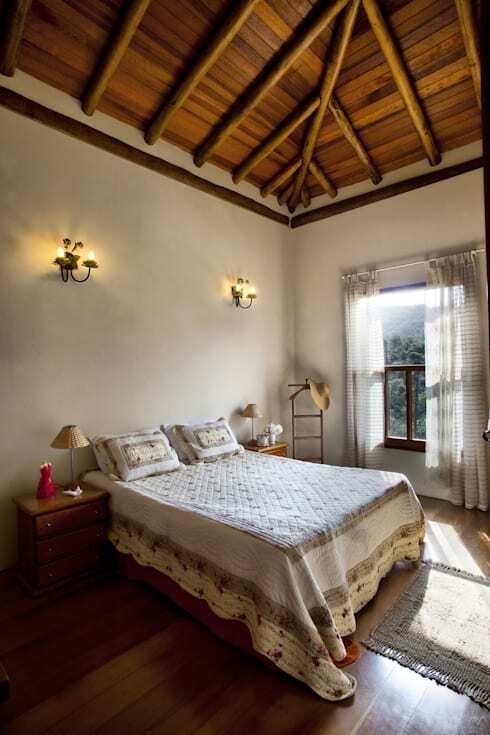 Wooden ceiling, white walls and a large window overlooking greenery make this bedroom a charming sight. The colourful bed linen is an added plus. 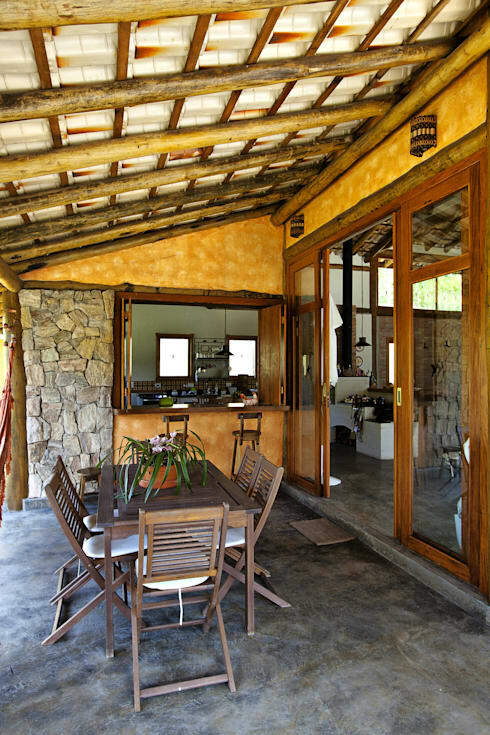 At the end of the tour, you see how beautiful the house looks with its stone foundation, warm yellow walls and recycled wooden frames. The backyard is complete with a large refreshing pool. Here is another story you can read –Modern, elegant and spacious – the perfect home?